Hello Girls! Honestly, I’m so happy to talk with you about this topic today because it makes me think that… summer is up to come! Soon we will be able to spend much time outdoors, doing trips, swimming in the sea or walking in the mountains. One thing is certain: if you are a lover of summer as I am, you will have at least a happier mood! I have to admit that I’m the first one who makes “beauty mistakes” during the summer period, just because we change our paces, we travel more and we have, in general, more freedom in managing our commitments. Isn’t that true? However, there is a difference between beauty habits (in the realization of which we can be more flexible) and health habits. 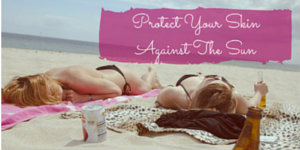 I think that pay close attention to protect our skin, especially in summer, has more to do with health! Why is Important to Protect Skin from Sun’s Rays? Overexposure to sunlight can result in painful, red, sunburned skin. A bad burn can also cause consequences like skin cancer later in life. Long-term overexposure can cause wrinkles, freckles, age spots, dilated blood vessels, changes in the texture of the skin that make skin look older! Sun protection is important because it helps to reduce these effects. Remember: Most types of skin cancer can be prevented or successfully treated if they are found early! 1) Ultraviolet B (UVB): it causes sunburn and plays an important role in the development of skin cancers and melanoma. 2) Ultraviolet A (UVA): it penetrates the skin more deeply than UVB does and it is the cause of the premature aging of the skin and wrinkling. CHECK OUT THE BEST LIP BALM TO PROTECT YOU LIPS FROM THE SUN! …Things to Know and to Do! #1 The sun’s rays are strongest between 10 am and 4 pm . The greatest sun damage occurs in this period of time so it would be better to avoid exposure to the sun during it. #2 It is not the heat that does the damage but the UV radiation in sunlight, which is present all year. You can get a lot of UV exposure doing winter sports, such as skiing, as it is often done in sunny weather. #3 Always use a sunscreen factor grater than 15 SPF because a lower one doesn’t protect your skin enough, especially if you find yourself at sea or in a very hot Country. #4 As for the face creams and make up in general, also sun creams expire. So, check the expiration date on the packaging before use it! #5 Avoid to leave the creams under the sun: heat can alter their active protective ingredients making them less effective! #6 Do not forget that wet clothes let through more UV light than dry clothes. #7 Do not forget that UV light passes through the clouds, especially if the clouds are thin: so in summer you still need protection even if is a cloudy day! #8 You are exposed to the UV light even if you are in the water, also because water (as sand and snow, too) reflects highly the light. So the risk of getting burn is even higher than standing out of it. #9 You are more exposed to the UV light if you find yourself at high altitudes. #10 Artificial tanning from sun-ray lamps and sunbeds is just as damaging as sunshine, so avoid them. #11 Self-tanning lotions are a safe alternative to the sun. How they work? They contain dihydroxyacetone, which interacts with proteins in the skin to produce an orange/tan color that doesn’t wash off, similar to the effect we get under the sun. #12 Remember always to protect your lips and you’re eyes using lip balm containing an SPF, and sunglasses. #13 Apply sun cream several times a day, not just once! Infact, if you take a bath or you sweat the cream will loose some of its properties. How to: Treat a Sunburn! ♦ Wet a towel and leave it in the fridge for a few time and, when it is cold, place it on the burn: this will ease the pain. ♦ One effective way to extract heath from the skin is to apply on the burn area some potato slices! The natural starches found in patatoes will help to extract heath from the skin. ♦ Drink a lot of water: it will help to hydrate you after prolonged exposure to the sun. ♦ If you feel a lot of pain take a anti-inflammatory medicine. Apply an abundant amount of aloe cream on the sunburned areas: this will help to reduce redness and to refresh irritated skin. Well Girls, that’s it for today. Have fun this summer… but do it in a healthy way! What are your tips against sun burns?